It’s a simple fact of life: Chubby cats are pretty much the cutest things on Earth. The only problem is feline obesity is pretty much an epidemic — and being overweight poses a serious health threat to your pet. Due to limited space (and the fact that you can’t exactly throw Furball on a treadmill), getting your indoor kitty into fighting shape isn’t easy. But it is possible with some creative tactics. 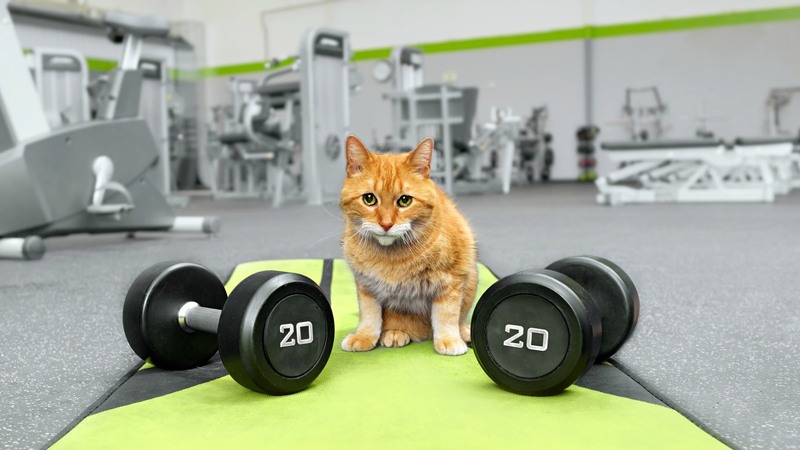 We’ve come up with six simple tips that will get your cat in shape in no time. If you’re trying to whip your cat into shape, you probably need to cut back on the treats. But that doesn’t mean you still can’t show your kitty some love! Buy fun toys instead of food. Focus on items that will really get your cat moving, like a stringed feather on a pole that your cat will never get tired of swatting at. Dr. Justine Lee, veterinary specialist and author of It’s a Dog’s Life… but It’s Your Carpet and It’s a Cat’s World… You Just Live in It recommends getting a laser pointer to use with your cat. The bouncing light will get even the most sessile of felines up to paw at it. Make sure there are safe vertical spaces in your home for your cat to jump on, Jean Hofve holistic veterinarian and author of The Complete Guide to Holistic Cat Care: An Illustrated Handbook suggests. This could be a windowsill, a set of empty shelves or a cat tree. This way, even when you’re not home to play with your kitty, he still has an opportunity to burn some energy by jumping. If you’ve got a super-lazy cat that does nothing but eat, make that work for you, Lindsay Stordahl, owner of Run That Mutt and blogger at ThatMutt.com suggests. Separate his water and food so that simply moving from one to another burns some calories. Keeping the food and water bowls on different floors would be ideal. This tactic from Dr. Ernie Ward, founder of the Association for Pet Obesity Prevention and author of Chow Hounds: Why Our Dogs are Getting Fatter, plays on the same idea as Stordahl’s suggestion, but involves a little more work on your part. Move your cat’s food during feeding time from a counter to the floor and back again, forcing your feline to jump around during eating. Make it a game for your cat with lots of snuggling rewards when they make the jump. More: Why Are Cats So Obsessed With Boxes? What cat doesn’t love a cardboard box or a balled-up piece of paper? Lee also recommends leaving fun non-toys laying around so your cat can get a little impromptu workout in. Leave these items around the house in high places where your cat can safely jump to amp up the kitty cardio. Originally published January 2011. Updated July 2017.